We had two free practice sessions on Thursday and we used both of those to learn the track. I had lots of time in iRacing prior to the weekend to figure out basics but there’s nothing like actually running laps. 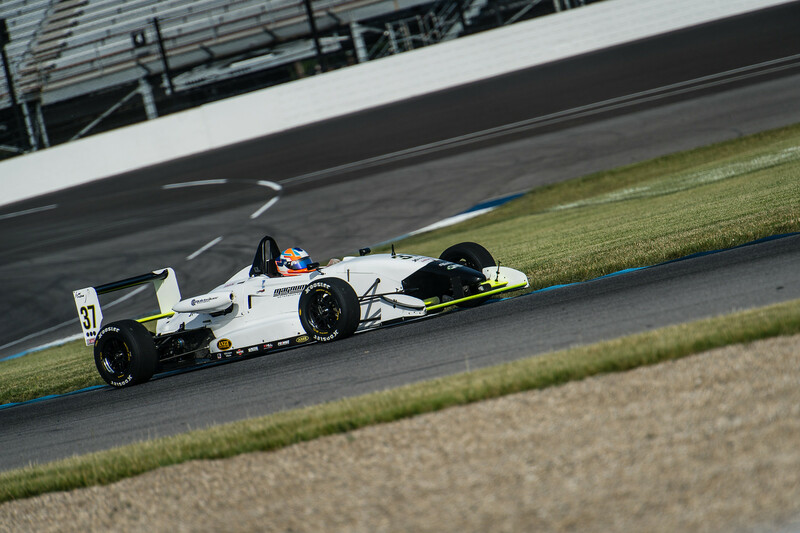 I was able to bike ride the track in the morning and take our street car around prior to the first F2000 session. 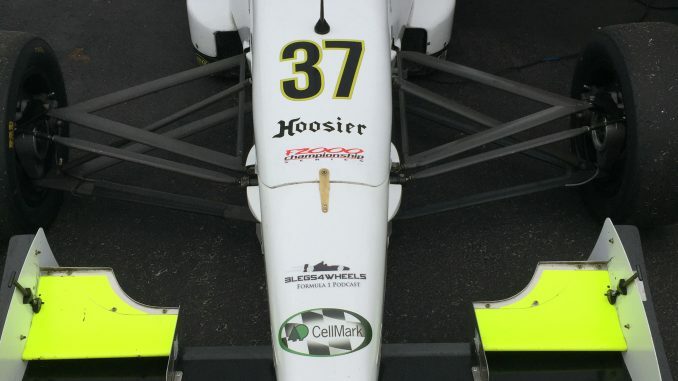 We started with a lot of downforce to make learning easier and peeled it off as I got comfortable. 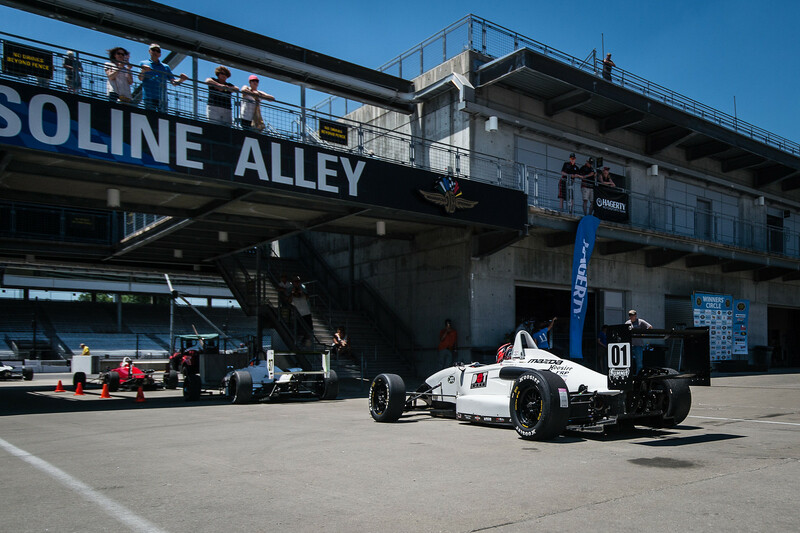 VIR is really tough – it requires a ton of commitment and I know I was leaving time on the table all weekend. By the end of the day we weren’t setting terribly competitive times but that was largely due to running on old tires compared to some others who went out on new sets. I felt like I had some time in my pocket for qualifying. In qualifying for race 1 a car lost it in front of me on the out lap on cold tires which paused the session. In cases like that, while the track workers pick up the car, we’re brought into the pits and held there while the track is cleared. The session time runs even though we’re off track. That meant there would be a mad dash to set times once we were released. When the session went back to green, I went right to P2. As others came up to speed we were bumped further down the order. The times were coming down and we were keeping pace with the top 5. My last lap was my flyer and it felt great but the time wasn’t that good. We ended up P7 which was a solid effort but not what we were aiming for (top 5). In the race – you’ve probably figured out – we had a tough break. Another driver dive bombed into turn one and nailed me in the right rear. The damage wasn’t too bad but it was enough to end our day. He actually hit me twice – once in the right rear which spun me around and then another time on the front wing which broke our nose. I drove the car around and retired it after one lap. I’ve attached a couple videos so you can see what happened. The other driver apologized and took the blame but it was still gutting. For race 2, we just did not have enough time to repair the damage. While the damage wasn’t extensive, the time was short. We were running the weekend with the Pirelli World Challenge cars and they requested we move our 2nd race up one hour earlier. This spelled the end for us as we could have finished our repairs with the extra hour. We didn’t make it out for race 2. I watched some of that race and it looked messy. I think I could have got a top 5 just by finishing that one – huge bummer! As a whole I think on pace we’re in good shape. VIR was never going to be our strongest track. It was my first time there and it doesn’t fit my style. I expect to be more competitive at the other tracks where I am more familiar. 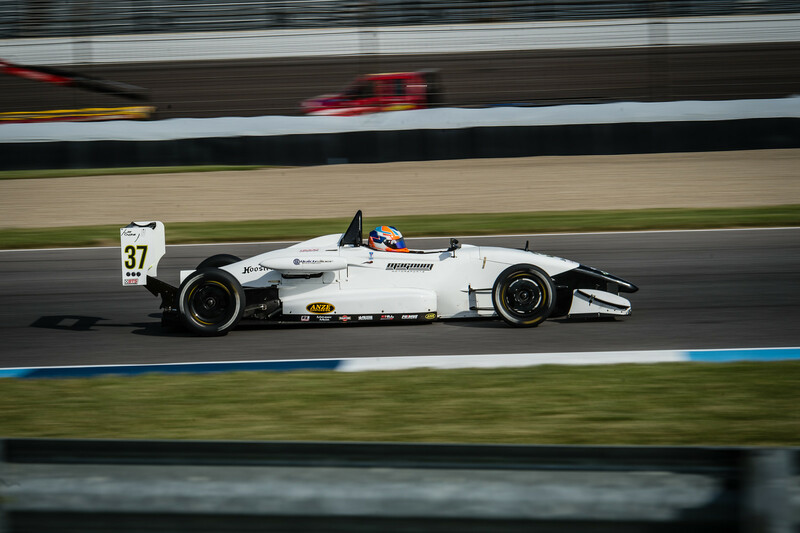 F2000 goes to Mid Ohio next in two weeks but we had planned to sit out that race. We’ll be back out there at Indianapolis in early June. 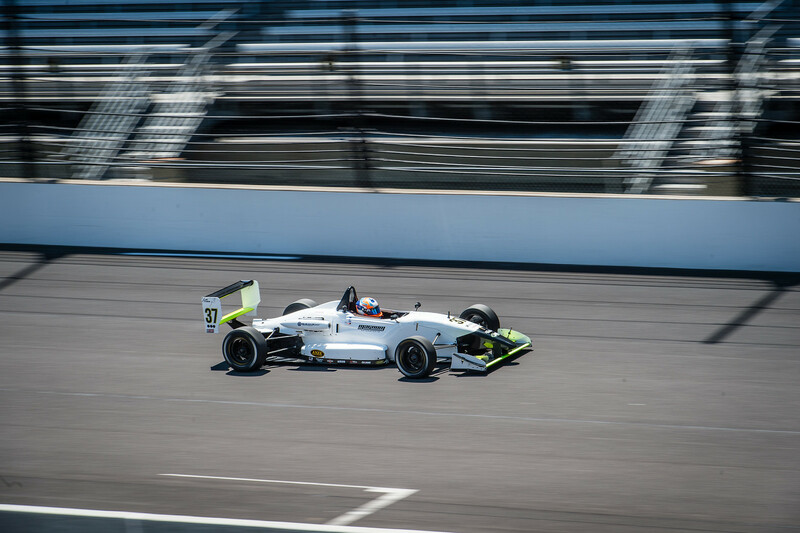 When you drive into the Indianapolis Motor Speedway you quickly realize it’s no ordinary racetrack. The famous Speedway Museum and Hall of Fame greets you as you rise out of the tunnel from under the south short chute. Look right – the spot where Danny Sullivan recovered his spin to win in ’85. Look left – the spot where James Hinchcliffe nearly lost his life in a crash in 2014. Look behind – the spot where Scott Brayton lost his in ’96. You can’t go anywhere without thinking of the legends that have been there before you. The Pagoda, the scoring pylon, the bricks – reminders that it’s not just a race track, it’s living, breathing history. Before any racing we actually got to take our rental car (Nissan Altima, lol) around the oval. My Dad drove. We joked that just two weeks prior, Fernando Alonso put his car right on the inside curbing at 230 mph. My dad struggled to do the same at 75! The short straights between 1 & 2 and between 3 & 4 are shorter than they look on TV. It must be incredibly quick in an Indy car. It blows me away that guys were hitting 200 mph in 1970s machinery through those sections. Our weekend on track on the road course started smoothly but we were a bit off the pace. In practice 1, we went out in a group of cars to learn the track. This was not the best move. Other drivers were smoking tires under braking all over the place! I found it difficult to learn my reference points and to feel the tires under braking. Because I ran in that group I did not run a clean, fast lap by myself. We were P12 after that practice. We checked video and data systems for areas to improve. I planned some driving changes. We also made some adjustments to aero (removing downforce) in preparation for qualifying later. 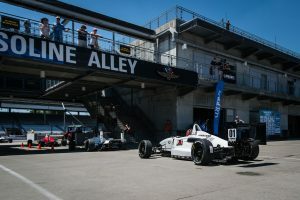 Qualifying was two 25-minute sessions with your single best time from either session determining your starting position. The first session was Friday evening and the track was still warm from the heat of the day. The second on Saturday morning promised to be a bit quicker due to lower ambient temps. We had a nice second qualifying session for P8. One guy had a quicker time on Friday so we were gridded P9. The race was a bit of a disappointment. I slotted in nicely on the start, up a couple positions and ready to move forward. When I got back to power after turn 1, the engine sputtered and popped – big misfire. That killed my momentum and some cars went past. The misfire remained constant for the rest of the race. In corners, I could keep up with the others but down the long straightaways I was defenseless. I picked up a some positions when other cars went off track or had issues and only managed to stay in front of a couple other cars on pure pace. We ended up 14th. Looking through the engine after the race, we found that the 4th cylinder ingested a portion of the throttle butterfly. The steel piece was embedded into the top of the #4 piston. During the race, it slammed into the spark plug, closing the gap – that explained the misfire. Worse, when our engine builder saw the top of the piston he advised us not to run the second race to avoid further damage. Competitively, we were disappointed in our results. 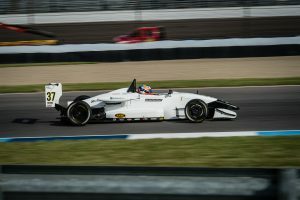 We had solid pace in qualifying and were positioned to contend in both races. 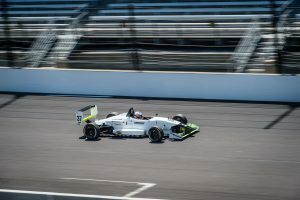 As an experience, it was so great to get a chance to race at Indy. I’ve been watching my heroes race there all of my life and to run in their tire tracks was a lifelong goal. In race 1 we ran a strong P4 for the first half of the race. I slipped back to P5 after missing a shift onto the front straight but held onto the guy that got in front of us until he spun on his own. I checked up to miss him and the guy behind me came through with a head of steam and passed us both. Gained one spot, lost another. We finished P5 from there. Solid run. In qualifying for race 2 we had our coolest moment of the weekend. Halfway through the session I cut a good fast lap and it was enough for P1 at the time! I’ll never forget the radio call from my dad: “Uh, you’re actually on the pole right now”. I’ll admit I wasn’t expecting that and proceeded to drive the sloppiest lap of my weekend. Felt the pressure. We slipped back to P2 and ran out of fuel with two laps left in qualifying. On those laps, two more guys went faster so we qualified P4. I drove too conservatively on the opening laps of race 2 and lost 2 positions. I made a pass to take one back after the race settled down. We ran the rest of the race in P5 and brought it home from there. Two top 5s on the weekend was a nice effort for us and it was great to just get some solid finishes. You know how our year has been so far so you can imagine the relief at a couple of good results. Bottom line – the car is fast when it works. We just have to stay of top of it and make sure it’s healthy for the next race in New Jersey in October.